In 1983, Oceanwide Expeditions began escorting travelers to Spitsbergen for Arctic adventures; today the company has a four-ship expedition fleet that visits both the Arctic and Antarctica. With a self-owned fleet Oceanwide Expeditions can tightly control the experience it offers passengers. Aboard any of its ships, you'll get close to glaciers and icebergs, polar bears and Arctic foxes, penguins and seabirds. The ice-strengthened 3,211-ton m/v Plancius offers a plethora of polar voyages. Built in 1976 as Hr. Ms. Tydeman, the ship sailed for the Royal Dutch Navy until 2004. Oceanwide Expeditions purchased the ship in 2009 and had it completely rebuilt. Now the rugged m/v Plancius accommodates 116 passengers in 53 cabins, and the ship complies with the most up-to-date SOLAS (Safety of Life at Sea) regulations. The ship and its crew have one goal: to get you close to some of the most striking natural settings on the planet. The ship is manned by 18 nautical crew members, 19 hotel staff, one expedition leader, one assistant, six guides/lecturers and a doctor. Together they present an educational program, both onboard the ship and during shore excursions, that paint a complete picture of the region you're sailing, from the geography to the wildlife to the impact of climate change on the destination. Whether sailing the Arctic or Antarctica, you'll often explore via Zodiacs. There are actually two gangways on the starboard side of the ship, so you'll never wait long to board a Zodiac for an excursion. Arctic itineraries that search for polar bears, Arctic foxes, whales, walruses and seals come in seven-, nine- and 13-night options. Antarctica voyages are even longer. You can opt to be onboard for nine, 10, 11, 19, 20 or even 36 nights. There are different itineraries to match your interest. South Georgia voyages are known for the variety of seabirds, seals and whales that are sighted. The Antarctic Peninsula expedition introduces you to seven species of penguins and plenty of whales, such as humpbacks, orcas and minkes. Plancius is a good-looking, rugged vessel with the quintessential navy blue hull and decks painted white. Since it was originally an oceanographic research ship, it's ideal for plying the waters of the Arctic and Antarctica so passengers can learn all manner of new things about the world around them. Oceanwide Expeditions is fond of saying that m/v Plancius is "a vessel with comfort and character." With five passenger decks, the spacious ship offers 53 cabins -- all with private bathrooms that include a shower, sink and toilet. Electrical outlets are standard European (220v, 60 Hz) with two thick round plugs. Americans will need a 220v/110v converter. You can select from four quadruple porthole cabins, two triple porthole cabins, nine twin porthole cabins, 26 twin cabins with a window, and two deluxe cabins. All of those configurations are 135 square feet. There are also 10 226-square-foot twin superior cabins. All cabins on the ship offer lower berths (one queen-sized bed in the superior cabins and two single beds in the twin staterooms), with the exception of the four quadruple cabins, which each feature two upper and lower beds, and the two triple cabins that are outfitted with one bunk bed and one lower bed each. The staterooms are comfortable, but you'll barely spend time in them, except when you lie down for a few Zs at night. The ship offers plenty of public spaces, including a restaurant/lecture room on Deck 3, plus an expansive observation lounge/bar on Deck 5 that offers panoramic views. Since you'll be viewing wildlife throughout the voyage, there are plenty of open spaces on deck. You can even walk all the way around Deck 4. All m/v Plancius itineraries are fairly adventurous, so you can expect fellow passengers to be fit and active. Most will be in their mid-40s to mid-60s, though plenty of healthy 80-year-olds have been known to book passage as well. Everyone that boards the ship should be in good physical condition. You should be able to walk for a few hours each day and be able to walk down and up the gangway, which can sometimes be slippery. You'll also need to board the Zodiacs at water level -- though crew members are always on hand to offer assistance as you get in and out. While there is a doctor onboard, he/she is not able to perform intricate medical procedures. Remember that you're visiting some of the most distant places on earth, and the weather can be challenging. It's not uncommon for passengers to have to walk across ice or slippery, rocky pathways ashore. Tread carefully. Medical facilities are far from the places you'll visit, so you'll want to make sure you're in excellent condition without the need for any daily medical treatments that wouldn't be available in such a remote locale. Cruisers hail from all over the world, and friendships form quickly. Some voyages cater to English speakers, while others are meant for German speakers. Sometimes voyages will be bilingual. 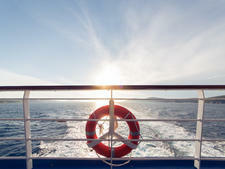 Check the itinerary to select the right voyage for you. Fares includes all meals aboard the ship, as well as snacks, coffee and tea. All activities and shore excursions are included, as is the program led by naturalists, complimentary use of snowshoes and rubber boots, some transfers, taxes and port charges, and comprehensive pre-departure reading materials. Tips are not included in the cruise fares. You'll make your contribution at the end of the voyage, and all tips will be pooled and divided among the crew. Oceanwide Expeditions suggests $8 to $10 per passenger, per day, and cash is preferred. In addition to m/v Plancius, the company sails m/v Ortelius, m/v Hondius and two schooners, s/v Rembrandt van Rijn and s/v Noorderlicht.